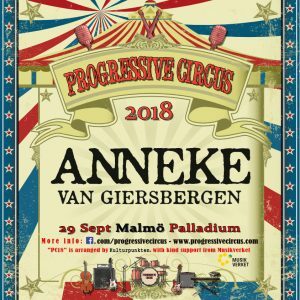 Ever since our first encounter with her, when her glorious voice rang out over the Rhine valley at the Night of the Prog festival in 2015, we understood that Anneke van Giersbergen is a phenomena we simply couldn’t let the PC audience miss. Anneke started her musical career as the vocalist and lyricist of Dutch melancholic metallers The Gathering in 1994, setting an example and paving way for many female metal singers to follow. After 13 years and some highly influential albums with The Gathering, time had come for Anneke to strike out on her own. She launched a solo career in 2007, including a multitude of collaborations in different genres, with artists and bands such as John Wetton, Anathema, Napalm Death, Within Temptation, apart from the more long-term collaborators Devin Townsend and Ayreon mastermind Arjen Lucassen. A highly recommended listening is the concept album “The Diary” (2015) by Arjen and Anneke’s project The Gentle Storm, with a story cleverly told once in a “Gentle” version, and then again with songs rearranged for heavier “Storm” versions. In 2016 Anneke decided to narrow her musical focus, choosing to go in a folk direction as a solo artist and in a heavy progressive metal direction with her new band VUUR, featuring some of the Dutch metal elite from The Gentle Storm and Ayreon backing her. With Anneke on the PC18 line-up, many goose bumps, tears and sing-alongs are garantueed as she brings her solo show to Sweden for the first time, with herself and an acoustic guitar on stage, performing selected favourites from her own career as well as covers. Progressive Circus 2018 is arranged by Kulturpunkten with support from Musikverket at Palladium, Malmö, September 29th. Follow us at www.progressivecircus.com and www.facebook.com/progressivecircus for more artist announcements and other news.